For the past couple of weeks, I have been working on several circuits. I was asked to make the circuits perform a certain task. For example, for the transistor logic probe, the green LED was supposed to light up when the probe was plugged into the negative end and the red LED was supposed to light up when the probe was plugged into the positive end. In the end, I successfully completed all of the circuits, as they each lit up after I used the proper input. 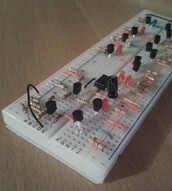 After building each of the circuits, I learned how to use a variety of tools (e.g. 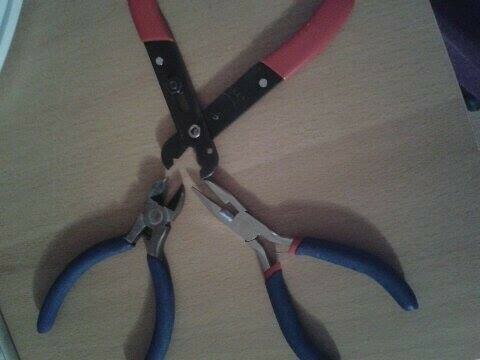 pliers, diagonal cutters, wire strippers) to create a good wire. I also learned how to visualize circuits in my head, rather than trying to make the circuit look like a schematic. Also, I learned how to arrange different components to allow current flow. The most important thing that I learned is that building circuits takes time and effort and it cannot be rushed. I enjoyed seeing my circuits light up, especially the 555 timer because it took a very long time until I could fix it. 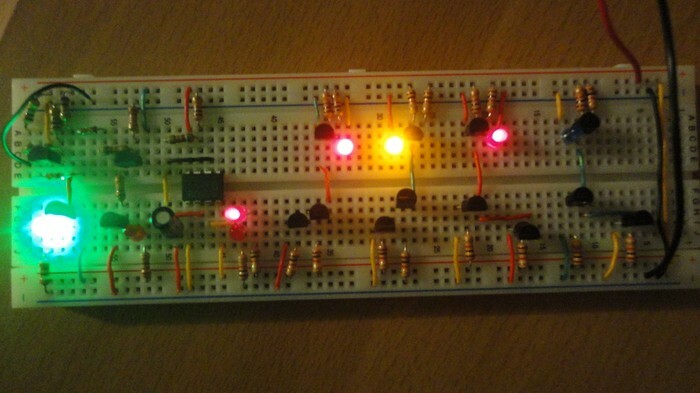 I liked using my knowledge of circuits to make sure that I would be successful. 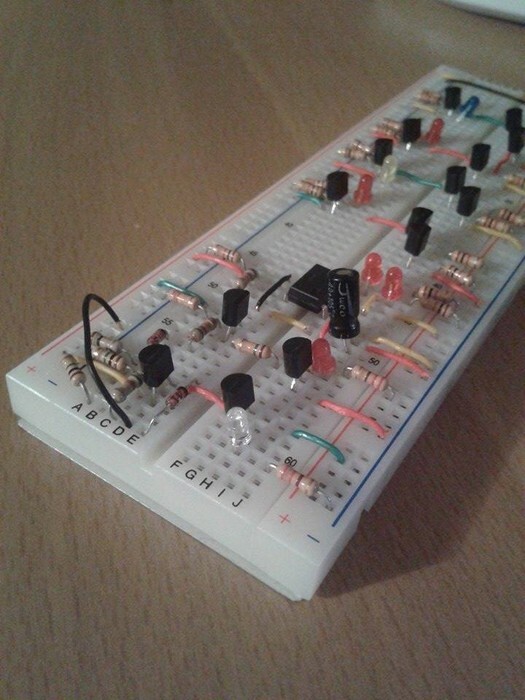 I enjoyed building circuits in general because it requires a lot of thinking. For example, I needed to think about conventional current flow because if I mixed up negative and positive, the circuit wouldn't work properly. I did not enjoy running into problems because most of the time, it took me a very long time until I could fix my circuit. Also, I didn't like the size of the wires of the different components because they were much too long, so i cut them down to make them fit perfectly. If you had to repeat the project over, what would you change? 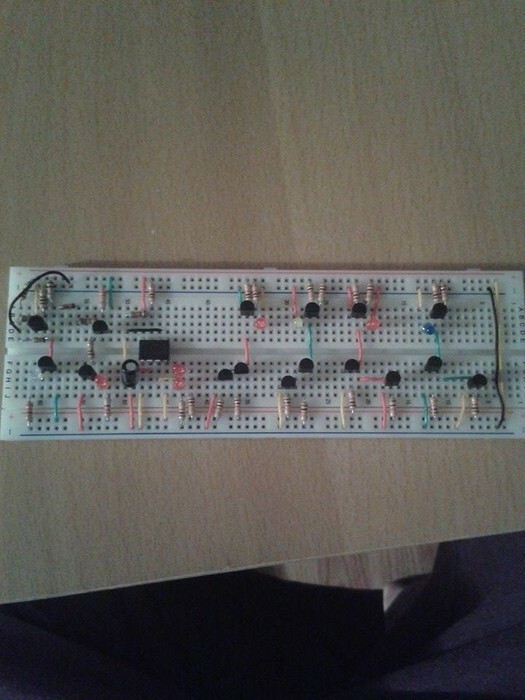 If I had to repeat the project over, I would definitely change the size of my circuits because in the end, I barely had enough room on my breadboard to construct all six circuits. Also, I would try to re-arrange the components so that it does not resemble the schematics. Overall, I really enjoyed building these circuits because I learned the basic skills of circuit building and I was able to use my knowledge of circuits to make them work properly. For my next circuit, I will try to make it look completely different from the schematic and I will try to make it tight together, to save space.